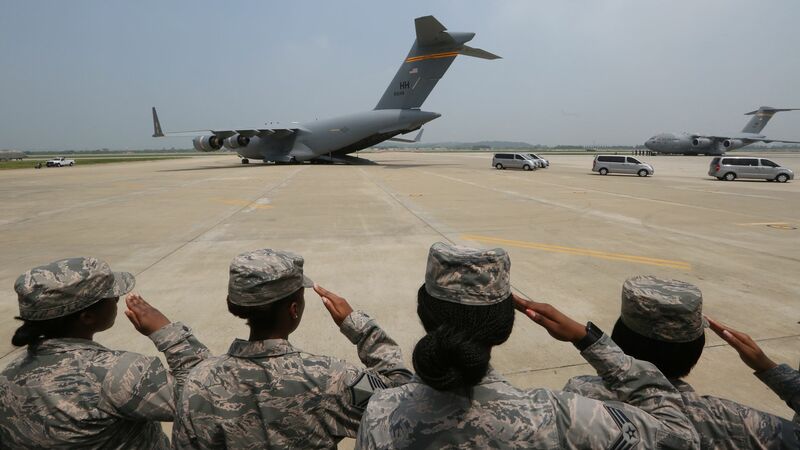 The Department of Defense released guidelines on Tuesday explaining the process of identifying the remains of soldiers returned from the Korean War. The big picture: Of the 36,940 Americans killed or injured in the war, around 7,699 are listed as missing, according to the Pentagon. While the 55 boxes of remains brought back to the U.S. are "presumed to be American," it's possible they could include remains of soldiers from other nations who also fought in the war. The details: An agency formed in 2015, the Defense POW/MIA Accounting Agency, is responsible for identifying the remains. The remains will be sent to "the largest and most diverse skeletal identification laboratory in the world," at Hickam Air Force Base in Hawaii, according to the Defense Department. The age of the remains — at least 65 years old — and the lack of forensic information provided by the North Koreans, could complicate the process of identifying all of the remains and may take years to complete.